This weekend I cleaned out my closet and brought my summer clothes down from the attic (in anticipation of a trip to Maryland, folks; no need for summer clothes here for a while). In the process I discovered a felted bag that I made a few years back, but which I rarely use, as it seems to be appropriate only for Easter wear. 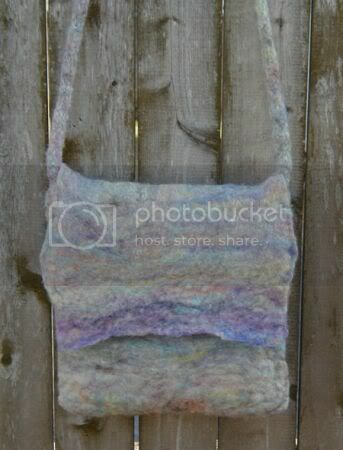 This bag was made by wet-felting a carded wool batt. It's about twelve inches square, and it's lined with a scrap of gray polarfleece. It was made all in one piece, with no sewn seams. The only knitted part is the I-cord strap. I used to do a fair amount of this type of felting (mostly hats made on inflatable balls), but I rarely attempt it anymore. It is faster than knitting, with a high immediate-gratification factor, but it requires a nice block of mostly uninterrupted time, and a certain amount of empty counter space, both of which are in short supply at my house at the moment. But one afternoon I got a hankering to play around with wet wool, and I decided to make some sort of bag. It came out reasonably well, although experienced felters would quickly notice some lumps and uneven spots. You'll notice that the wool is the same blend that I used to make my recent needle-felted bunnies. That's because this is my Official Wool For Fiber Experimentation. I bought a whole bag full of these bright, colorful batts in Easter colors at the Massachusetts Sheep and Wool Festival a few years back. They were cheerful, they were fun, they were inexpensive. I have spun some of it, wet felted some of it, needle felted some of it, and I have piles of it left. It's quite nice wool, but the colors are a little busy. I feel a little like an Easter egg when I carry the bag.